For the port, see Port of Felixstowe. For other uses, see Felixstowe (disambiguation). Felixstowe (/ˈfiːlɪkstoʊ/ FEE-lik-stoh) is a seaside town in Suffolk, England. At the 2011 Census, it had a population of 23,689. The Port of Felixstowe is the largest container port in the United Kingdom. The old Felixstowe hamlet was centred on a pub and church, having stood on the site since long before the Norman conquest of England. The early history of Felixstowe, including its Roman, Anglo-Saxon, Norman and medieval defences, is told under the name of Walton, because the name Felixstowe was given retrospectively, during the 13th century, to a place which had expanded to a form beyond the boundaries of Walton alone. In the Doomsday book, for instance, only Walton is shown, and not Felixstowe, which at the time held little more than a few houses scattered over the cliff tops. 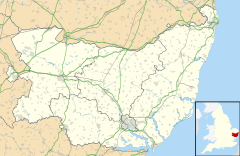 Walton was a settlement on the River Orwell and in 1844 had a population of 907 compared to the relatively small Felixstowe Parish holding only 502 people. Walton had always preceded Felixstowe as a settlement as seen by the presence of Walton Castle, built by the Romans in the 3rd century, but today Walton is generally considered part of Felixstowe due to modern expansion. Felixstowe is situated at the tip of the Colneis peninsular, and was in the ancient Colneis Hundred. The Felixstowe area as a whole provided a linchpin in England's defence, as proved in 1667 when Dutch soldiers landed near the Fludyers area and tried (unsuccessfully) to capture Landguard Fort due to strategic location. The town only became related to a major port in 1886 when the port opened to trade, following the initial construction of the dock basin in 1882. In 1810 or 1811 seven Martello Towers were built along the shore, of which 4 (Tower P on Wireless Green off Old Fort Road is the home of the local CoastWatch group, Q Tower in the town, and two more towards the Deben mouth) survive. Q Tower was the HQ of the Harwich-Ipswich-Martlesham Heath anti-aircraft guns between 1941 and 1945 (earlier it had been in Landguard Fort). On 11 August 1919, the Felixstowe Fury sideslipped and crashed into the sea 500 yards offshore soon after takeoff while on a test flight. It was preparing for an 8,000-mile flight to Cape Town, South Africa. The wireless operator, Lt. MacLeod, was killed, and the 6 passengers were rescued. The wreckage was towed ashore. At the turn of the century, tourism increased, and a pier was constructed in 1905 of which is partially functional to this day as an amusement arcade. Indeed, during the late Victorian period (after circa 1880) it became a fashionable resort, a trend initiated by the opening of Felixstowe railway station, the pier, (see above) and a visit by the German imperial family. It remained so until the late 1930s. Felixstowe played an important role in both world wars--in the first as Royal Naval Air Service and RAF seaplane base, and in the second as the Coastal Forces MTB, MGB and ML base HMS Beehive. It was the first base from which 2nd World War German E-boats and coastal convoys were systematically attacked--by flotilla led by Lt-Commanders Howes, Dickens, Hichens and Trelawney. Felixstowe was also HQ of the Harwich Harbour coast and anti-aircraft defences, and accommodated the RAF's 26th Marine Craft (Air-Sea Rescue) Unit. In 1944 the piers near the Dock were used to load troops, tanks and vehicles onto the British and American landing craft of "Force L", which reinforced the Normandy Invasion on its first and second days. In 1945 the German naval commanders in Occupied Holland arrived in E-boats at Felixstowe Dock to surrender their boats and charts to the Royal Navy. Most of the south-western area of Felixstowe Urban District, between the Dock, Landguard Point, and Manor Road, was occupied by the Navy, RAF and Army. with Landguard Fort and several ruined gun emplacements and bunkers a reminder of that era. Between the wars the seaplane station housed the RAF experimental establishment which tested seaplanes and flying boats. Its sheds and piers were incorporated in the MTB base and later the container port. J P Foynes: Who was to Blame for the Loss of HMS Gipsy. In 1953, at least 48 people died in the town in the North Sea flood. Landguard Fort, originally known as Langer Fort, is on the site of the last opposed invasion of England in 1667, and the first land battle of the Duke of York and of Albany's (later James II & VII) Marines. The current fort was built in the 18th century, and modified in the 19th century with substantial additional 19th/20th century outside batteries. The Fort hosts regular military re-enactments, including Darell's Day, which is a celebration of the last invasion, children's events and open-air theatre. In the two world wars the Fort was variously the HQ of the Harwich Harbour coast and anti-aircraft defences, the signal/control station for the harbour entrance, and a radio and radar station. Landguard Fort is in the care of English Heritage, and is managed by the Landguard Fort Trust to make it accessible to the public. A museum telling the story of Felixstowe, with a reference library, historic maps, photo archive and 14 rooms of artefacts from Roman finds, the Martello towers, military social and domestic history through two world wars and into the new millennium is managed by volunteers from the Felixstowe History and Museum Society. It is located in the old submarine mining establishment building at the Landguard Peninsula, between the Fort and Port. The pier was opened in 1906, and was then was rebuilt in late 2017; and re-opened in 2018. During the Second World War the majority of the pier, at the time one of the longest in the country and complete with its own train, was purposely demolished by the Royal Engineers to prevent it from being used as an easy landing point for enemy troops. After the war the damage was not repaired and the pier never regained its original length. The sole remaining railway station, called Felixstowe Town, was opened in 1898. The well-preserved station building now houses a supermarket and shops. Felixstowe Radio, the local community radio station that was formerly based in the building, has now moved to the old Coes building at the top of Bent Hill. In its prime the railway station saw more than 20 services a day, and is now served by an hourly service to Ipswich. The station now has only one platform, which has been created from the far end of one of the original platforms. Felixstowe Beach railway station was demolished in 2004, despite a storm of protest from many local people keen on saving the historic building which the council had branded as "unsafe". The station was originally opened in 1877 and was used continuously until 1959, after which it was the site of a small printers for many years until its demolition. From 1877 until 1951 there was also Felixstowe Pier railway station, sited inside the area of the modern day docks at a small pier popular with pleasure boats, and with a paddle steamer link to London. A dock next to the pier was approved in 1879. The main bus operators are Ipswich Buses and First Norfolk & Suffolk. Felixstowe railway station is the terminus of the Felixstowe Branch Line passenger service to Ipswich; the line itself branches before the station, the other branch going on to the Port of Felixstowe. The Harwich Harbour Ferry operates between the View Point (near Landguard Fort) in Felixstowe and Ha'penny Pier, Harwich and Shotley Point throughout the summer. The Bawdsey Ferry crosses the River Deben from Felixstowe Ferry. The National Express coach service 481 provides a connection to London with intermediate stops at other major towns such as Ipswich, Colchester, Witham, Chelmsford and Brentwood. A weekday service departs daily at 07:20 and returns at 18:00, while the weekend service departs at 07:55 and returns at 18:00. Felixstowe is administered by Suffolk County Council, East Suffolk District Council, and Felixstowe Town Council. Suffolk Coastal District Council, the local authority, is based in Woodbridge, although it has a part-time office in Felixstowe, which is open Mondays and Wednesdays. The local parish council, Felixstowe Town Council, is based in the town hall, on the seafront at Undercliff Road West. Felixstowe is twinned with the German towns Wesel and Salzwedel. Felixstowe lies within the Suffolk Coastal parliamentary constituency. The Member of Parliament for Suffolk Coastal since the General Election on 6 May 2010 has been the Conservative Dr Therese Coffey. Landguard Fort is a scheduled ancient monument and visitor attraction with a nearby nature reserve. At the opposite end of the town is Felixstowe Ferry Golf Club, which is amongst the oldest in the UK, having been established in 1881. The Rt. Hon. Arthur Balfour, Captain of the Golf Club in 1889, became Captain of the R&A in 1894 and British Prime Minister from 1902 to 1905. Felixstowe has a recently refurbished sandy beach south from the pier, and a stoney beach north of the pier. A Victorian promenade runs along part of the beach, from the nature reserve in the southwest to Cobbolds Point (Maybush Lane in east), with traditional beach huts along most of that length. An amusement arcade with snooker halls and food outlets occupies the southern end. The pier, incorporating a cafe and amusement arcade, stands before a leisure centre, with swimming pool, owned by the local council, now managed by a contractor. Cobbolds Point takes its name from the Cobbold brewery family who built Cranmer House on Maybush Lane in 1885. It is a Grade II-listed mock Elizabethan mansion by Thomas Cotman. Its listing describes it as "a fine house of the period reflecting the wealth of this important Suffolk family of brewers". The architect Thomas W Cotman (1847-1925) designed many of the most famous buildings in Felixstowe including the Railway Station, Harvest House (Felix Hotel), the Orwell and Bath Hotels, Barclays and Lloyds Banks plus many others. He also designed and lived in the original bungalow that forms the lower two floors of Cotman Lodge care home. He was the nephew of John Sell Cotman, the famous Norwich water-colour artist. The Art Deco style of architecture has been used for some buildings. The Cavendish Hotel in Sea Road, demolished in 1988, was in this style. There is another example in Undercliff Road West, which has been home to the Felixstowe Tourist Information Centre. This building was put up for sale in mid-2014, causing concern for its future. From Brackenberry Fort to Felixstowe Ferry there is a walkway and is the start of the 50-mile Suffolk Coast Path. At low tide from Jacob's Ladder, it is possible to glimpse the seaweed-covered remains of a Roman fort, which could possibly be the place of Dommoc, in the water about 50 yards from the coast, where it suggested St Felix first landed in England. Perhaps the most striking building on the front is Harvest House. Originally built as the Felix Hotel, it then became Fisons' headquarters. It has now been converted to apartments for residents of retirement age, many with fabulous views over Felixstowe. Felixstowe Rugby Union Football Club was founded in 1930 and plays in the Eastern Counties Leagues. The town's only senior football team, Felixstowe & Walton United, compete in the Eastern Counties League Premier Division. The town has a sports centre, the Brackenbury in High Road East, and football, hockey and rugby pitches, together with four bowling greens and other sporting facilities. The sports centre, owned by the council, is managed by a contractor. Felixstowe Golf Club is a links course to the northeast of the town centre. Eastward Ho! Golf Club, Felixstowe (now defunct) first appeared prior to the First World War. The club closed at the time of the Second World War. Felixstowe Ferry Sailing Club is located beyond the golf course at the Bawdsey Ferry end of the town. It sometimes plays host to national and international championships for various dinghy classes, and has its own clubhouse with bar and dining facilities which were refurbished following the tidal surge of December 2013. The clubhouse is available for hire and has views of the sea and the river Deben. Felixstowe draws tourist visitors, and has traditional seaside offerings such as Felixstowe Pier and The Seafront Gardens. There is also the Forum Amusement Centre, Ocean Boulevard and Manning's Amusements. Visitors can also see Landguard Fort, Landguard Nature Reserve, Felixstowe Ferry and the Felixstowe Museum. To cater for visitors there are a number of hotels and guesthouses, self-catering properties and camping/caravanning sites. The town has two main leisure facilities: the Brackenbury Sports Centre in Old Felixstowe and the Felixstowe Leisure Centre adjacent to the pier. There is a bowls club and a tennis club has hosted a large post-Wimbledon tournament. There is also a community centre, run by the Old Felixstowe Community Association (OFCA) in Ferry Road which is the home to around thirty user groups from the surrounding area including sports sections and clubs for the very young to adults and senior citizens. The centre also houses several halls which are available for hire to the public. The library was refurbished in 2006 at a cost of £1,500,000, and has since won national awards. Felixstowe Radio is the community radio station that has broadcasts on 107.5 FM to the local area and via the internet. The most southern park in Felixstowe is Langer Park, which lies between the railway line running north from the Port of Felixstowe and the houses running along the western side of Langer Road. Its north and south parameters are given by the Lidl superstore and Beach Station Road accordingly, giving the park a long rectangular-like shape. The park holds host to a narrow stream of which is the last remnant of the late Walton Creek, which had originally run from the Ordinance Hotel (demolished as of late 2014 to make way for a Premier Inn) to the Felixstowe Dock Basin. The park itself is mainly covered by open green space in which to partake field sports, and is also accompanied by a what once was a small play area. The current play equipment of 2015 is only present by the 'Parks for People' scheme by the Big Lottery Fund and Heritage Lottery Fund, and is much more modernized than the pre-existing swings. This park is situated alongside Coronation Drive and Mill Lane, with a sectioned-off children's play area and open green space for specifically sports use. Access can be gained via a side alley at the Eastern side of Coronation Drive, through the Rugby Union entrance on Mill Lane, or by a small footpath coming off King Fleet Road. The opening of the sports ground opened on 1 May 1956 under H.R.H. The Duke of Edinburgh. The grounds are home to the Felixstowe Rugby Union Football Club which as of March 2015 had a Pitchero Club Ranking of 1205th. It also provides facilities for junior football and cricket, which is home to the Felixstowe Corinthians Cricket Club. These facilities are accompanied by a small car park housing 20 spaces and changing rooms. The largest and most northern of the Felixstowe parks consists of a woodland named The Grove adjacent to Eastward Ho playing fields. The Grove woodland is formed mainly of ash, oak and sycamore trees whilst allium ursinum or wild garlic grows here during the spring. Eastward Ho was originally a golf course but nowadays is a public recreational space featuring a number of football pitches, changing facilities and an enclosed children's play area. This play area features in the music video for Ed Sheeran's single Castle on the Hill. On the western side of The Grove is another woodland named Abbey Grove planted in 1998 and maintained by The Woodland Trust with permitted access to the public. The area, though not the park itself, was suggested in November 2014 to be part of the construction site for 570 new homes as set out by the District Council's Strategic Housing Land Availability Assessment. This proposal was formed due to the lack of available housing in Felixstowe, though Suffolk Coastal conclusively identified the land as not suitable and claimed in 2015 that there were already enough alternative sites within the town for residential expansion. Original ideas for a Skate Park were clearly addressed in 2004 by the Felixstowe Skate Association, who organized a number of meetings and poster campaigns to start the initial project. They also brought out newsletters to help build public opinion of the idea, which attracted attention from other groups. Level Two (a local youth organization) eventually took up management of the fundraising process and in 2007 managed to secure a grant of £25,000 from the government's youth opportunity fund. Additionally by this date, the Felixstowe Town Council had already set aside £30,000 for the project, as well as £15,000 agreed upon by the Suffolk Coastal cabinet and £40,000 from the playspace fund. When completed the project took a total of £180,000, and was opened at a community event on 1 September 2009. The original designs by the FSA included provisions for CCTV and Floodlights to ensure youth safety, and further into the design process some metal wire cages of rocks added to help soundproof the area. These safety precautions were expanded upon in 2011 to include a nightly visit from police after there were accounts of vandalism to the facilities, including the ripping out of a CCTV camera and a smashed floodlight. Named after the late Edmund Henry Hynman Allenby (see notable persons section), the park was formed in 1923 when the Allenby owned Felixstowe House was demolished at the passing of Catherine Allenby. It also used to be the site of the Eastern Counties Bible Convention from 1920-1939 until it was held inside churches. It consists of a small all-weather football playing field, a sectioned off children's play area, and winded path around the layout of the park. Park access can be gained from Constable Road. Enclosed between Cornwall Road, Margaret Street, Cage Lane and Seaton Road is Seaton Park. The park is rectangular in shape and used to include toilets, but sadly they got damaged and are now unusable, so they have been closed off. And mainly consists of open space with an enclosed children's play area. 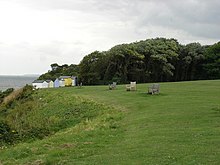 Clifftops is accessed from Cliff Road next to Felixstowe Ferry Golf Club and is the most easterly park in Felixstowe. As the name suggests the park sits atop cliffs overlooking the North Sea, Deben Estuary and golf course. This is primarily used as pay and display car parking with a large grass open area used for both recreation and for overflow parking during peak times. Toilet facilities are available on site. The beach below can be accessed on foot via steps. Felixstowe is Britain's largest container port. The main navigation channel is dredged to 47 1⁄2 feet (14.5 m) below chart datum, and a depth of up to 49 feet (15 m) alongside the quay. Felixstowe boasts deep-water able to accommodate the world's latest generation of deep-draughted ultra post-Panamax vessels. There is a continuous quay of 1 1⁄2 miles (2.4 km), equipped with 25 ship-to-shore gantry cranes. It has road links to the Midlands via the A14 and to London via the A12 road. The single-track railway line to Ipswich has recently been upgraded to allow larger containers, and many containers are now transported by rail. The port is owned by Hutchison Port Holdings Ltd with additional land on the peninsula owned by Trinity College, Cambridge. The port has its own Police Authority, which also currently has jurisdiction over the area local to the port (with permission from Suffolk Constabulary's Chief Constable). Alongside the Port Police, they also have their own joint ambulance and fire service. One of the port ambulances, call sign 'Alpha 1', can also come off port to attend 999 emergencies in Felixstowe. Felixstowe's Church of England parish churches include Christ Church, St Andrew, St Edmund, St John the Baptist, St Mary the Virgin, SS Peter and Paul with SS Andrew and Nicholas and St Philip. Felixstowe has Baptist, Free, Methodist, Roman Catholic, Russian Orthodox and United Reformed churches. Len Evans AO OBE (31 August 1930 – 17 August 2006) was born in Felixstowe, England, of Welsh parents. He was a distinguished Australian promoter, maker, judge, taster, teacher and drinker of wine. Glenn Howerton, American actor best known for starring in It's Always Sunny in Philadelphia, resided in Felixstowe for several years of his childhood. Noma Dumezweni, Oliver Award-winning British actress best known for her portrayal of Hermione Granger in broadway's Harry Potter and the Cursed Child. Dumezweni grew up and was educated in Felixstowe. The first pirate radio station off the British coast operated from a ship anchored off Felixstowe. Radio Caroline ship MV Caroline was outside the three-mile limit at Easter 1964. It was the very first UK radio station aboard a ship in the North Sea, and intended to break the monopoly of the BBC. Radio Caroline had about seven million listeners in its first week on air. The station's slogan was Your all-day music station, and it initially broadcast from 6 am to 6 pm, seven days a week. The transmitter had a power of 10 kW on 199 metres – 1.520 kHz. The ship moved to waters off the Isle Of Man in July 1964 to become Radio Caroline North, while MV Mi-Amigo of Radio Atlanta on 201 metres became Radio Caroline South, broadcasting on first 199 later on 259 metres – 1.178 kHz with 50 kW of power on medium wave. The Mi Amigo remained in waters off Clacton-On-Sea, Essex. Felixstowe Museum installed an offshore radio display in their tearoom in 2015. This is being moved and expanded into the Museum itself from 2019, as part of a 1960's themed display. ^ "Area: Felixstowe (Parish): Key Figures for 2011 Census: Key Statistics". Neighbourhood Statistics. Office for National Statistics. Retrieved 6 May 2015. ^ "The Ports Industry in England and Wales (2006-07)" (PDF). ^ Dyckhoff, Tom. "Let's move to Old Felixstowe, Suffolk". The Guardian. Retrieved 15 April 2015. ^ "Town History". Felixstowe Town Council. Archived from the original on 23 May 2009. Retrieved 16 April 2015. ^ White, William (1844). History, gazetteer, and directory of Suffolk, and the towns near its borders. Sheffield. Retrieved 16 April 2015. ^ "A Track Record of Always Leading the Way". Port of Felixstowe. Retrieved 18 April 2015. ^ "Article" (PDF). timesmachine.nytimes.com. 1919. ^ "Full text of "The Suffolk traveller"". archive.org. Retrieved 4 April 2014. ^ "Languard Fort Trust". Languard. Retrieved 18 April 2015. ^ "Home | Felixstowe Museum". felixstowemuseum.org. Retrieved 21 August 2015. ^ "Felixstowe Station Walk". National Express East Anglia. Archived from the original on 15 August 2009. Retrieved 25 January 2010. ^ "Felixstowe Railway and Dock Bill". Hansard. Retrieved 25 January 2010. ^ "Harwich Harbour Foot & Bicycle Ferry - Home". ^ "Foot & Cycle Ferries". felixstowetravelwatch.onesuffolk.net. Retrieved 21 August 2015. ^ "National Express Coaches". felixstowetravelwatch.onesuffolk.net. Retrieved 21 August 2015. ^ "Cranmer House, Felixstowe". British Listed Buildings. ^ "Cotman House". Archived from the original on 26 June 2014. ^ "Felixstowe: Calls to 'list' seafront art deco tourist centre to protect it from bulldozers". EADT24. 10 August 2014. Archived from the original on 1 September 2014. ^ "For Sale: 91-95 Undercliff Road West, Felixstowe, Suffolk IP11 2AF" (PDF). Spice Property Consultants. July 2014. Archived from the original (PDF) on 1 September 2014. ^ "England Hockey Awards - another fantastic evening!". ^ "Home". www.felixstowefootball.co.uk. Retrieved 21 August 2015. ^ a b "Eastward Ho! Golf Club", "Golf’s Missing Links". ^ "Felixstowe Ferry Sailing Club — Join Felixstowe Ferry Sailing Club today for family friendly sailing at all states of the tide". Ffsc.co.uk. Retrieved 20 September 2018. ^ "Special Interest Groups - CILIP: the library and information association". www.cilip.org.uk. ^ Cornwell, Richard (16 October 2014). "Felixstowe: Ordnance Hotel is demolished to make way for Premier Inn". Ipswich Star. Retrieved 14 April 2015. ^ "Langer Park". Visit Felistowe. Retrieved 14 April 2015. ^ "Pitchero Club Rank". Pitchero. Retrieved 14 April 2015. ^ Tynan, Paul. "Coronation Sports Ground". Sports Facilities. Retrieved 15 April 2015. ^ Cornwell, Richard (9 April 2015). "Countryside site will provide homes needed to match Felixstowe's jobs growth". Ipswich Star. Retrieved 15 April 2015. ^ "Events July 2004 to October 2004". Felixstowe Skatepark. Retrieved 16 April 2015. ^ "New hope for Felixstowe skatepark". Ipswich Star. 18 May 2007. Retrieved 16 April 2015. ^ Cornwell, Richard (15 June 2011). "Felixstowe: Youngsters slammed after CCTV wrecked at skatepark". East Anglian Daily Times. Retrieved 16 April 2015. ^ "Opening: Felixstowe Skatepark". Felixstowe Skatepark. Retrieved 16 April 2015. ^ Cornwell, Richard (15 June 2015). "Felixstowe: Youngsters slammed after CCTV wrecked at skatepark". Eastern Daily Press. Retrieved 16 April 2015. ^ "Edmund Allenby – Liberator of Jerusalem". Orthodox England. Retrieved 16 April 2015. ^ "Background to the Convention". Eastern Counties Bible Convention. Retrieved 16 April 2015. ^ Port of Felixstowe. "Brief History". ^ "Cambridge University's Trinity College in £20million bid to buy the O2 arena". Daily Mail. 3 August 2009. ^ Archbishops' Council. "Christ Church Felixstowe, Felixstowe". A Church Near You. Church of England. Retrieved 6 May 2015. ^ Archbishops' Council. "Felixstowe: St Andrew, Felixstowe". A Church Near You. Church of England. Retrieved 6 May 2015. ^ Archbishops' Council. "Felixstowe, St Edmund, Felixstowe". A Church Near You. Church of England. Retrieved 6 May 2015. ^ Archbishops' Council. "Felixstowe, St John the Baptist, Felixstowe". A Church Near You. Church of England. Retrieved 6 May 2015. ^ Archbishops' Council. "St Mary the Virgin, Walton IP11 9DS". A Church Near You. Church of England. Retrieved 6 May 2015. ^ Archbishops' Council. "Felixstowe, St Peter & St Paul with St Andrew & St Nicholas, Felixstowe". A Church Near You. Church of England. Retrieved 6 May 2015. ^ Archbishops' Council. "Walton Felixstowe: St Philips, Felixstowe". A Church Near You. Church of England. Retrieved 6 May 2015. ^ "Bethesda Baptist Church, Felixstowe". Retrieved 6 May 2015. ^ "MRBC Felixstowe". Retrieved 6 May 2015. ^ "River of Life Church". Retrieved 6 May 2015. ^ "Trinity Methodist Church Felixstowe". Retrieved 6 May 2015. ^ "St Felix - Felixstowe". Diocese of East Anglia. Retrieved 6 May 2015. ^ "Felixstowe Orthodox Church". Retrieved 6 May 2015. ^ "Felixstowe United Reformed Church". Retrieved 6 May 2015. ^ Martin, Tom Philip, Matt (15 March 2018). "Glenn Howerton Is Dead Serious About Being Funny". GQ. Retrieved 20 March 2018. ^ "Noma Dumezweni". BBA Shakespeare. Wikimedia Commons has media related to Felixstowe.